Composer Clint Mansell, whose credits include Black Swan, Smokin' Aces and The Wrestler, is taking the musical helm on Mass Effect 3. I've always been a fan of the Mass Effect soundtrack. It's a sweeping blend of the subtle and bombastic, perfectly suited to the epic tale of galactic life and death, with a unique sound that never feels generically orchestral. But it appears that we're going to have a new man on the job for Mass Effect 3: Clint Mansell, an English composer with a long list of movie credits (and one television show) to his name. "I'm doing a video game this year actually. Mass Effect 3," he said in an interview with The Quietus. "As I was saying about Public Enemy and re-working old hip-hop tunes for Requiem, and kind of re-working old ballet tunes for Black Swan, with something like Mass Effect you're more like a DJ, with all these elements. You've got the holding pattern, then the big explosion where you need the score to kick in. Then you need to take it off on a tangent. You've got all these different elements that change depending on what the player does. You have to figure out an overall symphony, but be able to break it down into component parts. You can bring the pain when required." Jack Wall, the lead composer on the first two Mass Effect games, confirmed that we won't be taking part in the third. "I have had a great relationship with the folks at BioWare having done three games with them. We're all still very good friends, so nothing dramatic," he said. "I think it was just time for a change." "I'm so proud of the work I've done on the Mass Effect franchise," he continued. "It was just time to move on. I'm working on some very exciting projects and look forward to when I can announce them, but I also very much wish the dev team at BioWare all the best on Mass Effect 3." It's disappointing that Wall won't be working on the game. I'm sure Mansell is an excellent composer but Wall has an extensive and impressive array of videogames to his credit, including the Myst titles Exile, Revelation and End of Ages, Jade Empire and Army of Two. He crafted a very distinct tone for the Mass Effect universe and it's hard to imagine the game without it. As the saying goes, Mansell has his work cut out for him. 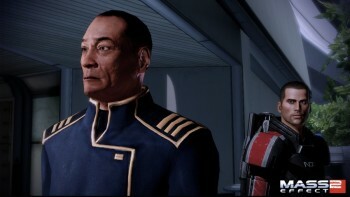 Mass Effect 3 is scheduled to come out in late 2011 on the PC, Xbox 360 and PlayStation 3. Thanks to Lost in the Void for the tip.